55 Mill Street, Warwick, Warwickshire, CV34 4HB. Walking down Mill Lane in Warwick you are straight into Merrie England and you wonder how much life here is interrupted by film crews trying the get the authentic experience. At the end of the lane is a small gate which leads into the garden and nothing prepares you for the sight that is to come for what was once road and houses suddenly becomes a fantastic cottage garden flanked on one side by the meandering River Avon complete with a romantic ruined bridge and on the other by no less than Warwick Castle itself. It is Wordsworth meets the Knights of the Round Table at the very least. The cottage itself was originally the bridge keeper’s house built in around 1398 to supervise most of the traffic through Warwick and in the state of the Earls of Warwick. 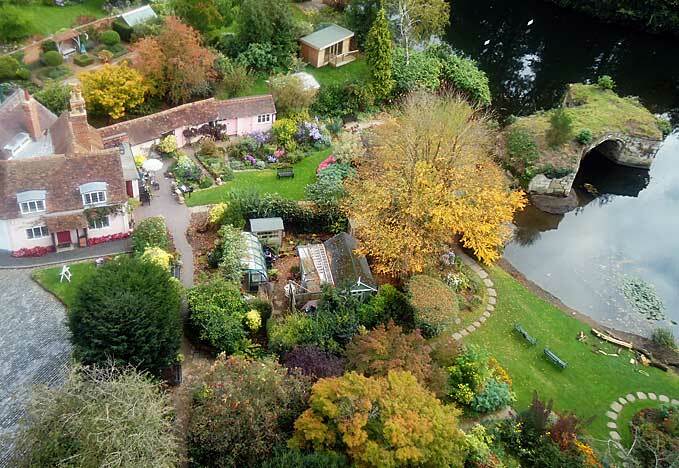 The garden was originally created by Arthur Measures and his wife Vi after they moved in in 1938 and has been continued by the present owners his daughter Julia and her husband David Russell. I have to say that I am cheating very slightly to include this garden in a website devoted totopiary but I did find a couple of things to say that it genuinely has topiary in it. I spoke to the lady of the house and she was amused that I had found the topiary dog. Or is it a pig? That’s the beauty of topiary it can be what you want it to be and in such a magical place I suspect it can be a vast number of things as the enchanted spells of such a spot get hold of the visitor. Grazing dog, or is it a pig? 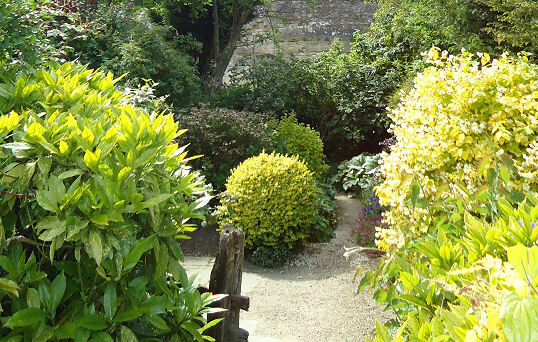 I have included this garden as it is just “England” especially on a sunny day as I was lucky to have. What it isn’t is chocolate box. It is man, nature and history in perfect harmony. 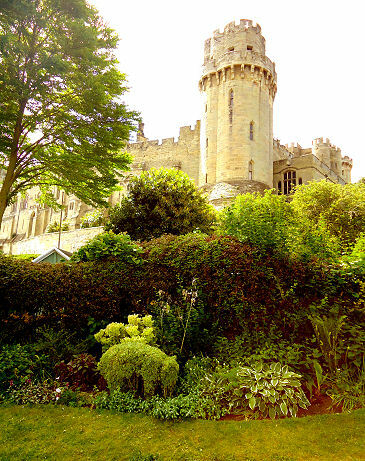 If you want to see England and a small english garden come to Warwick and put your money in the honesty box which laudably goes to charity and try not to get a just a little bit jealous as this spot will outlast any generation of owners. 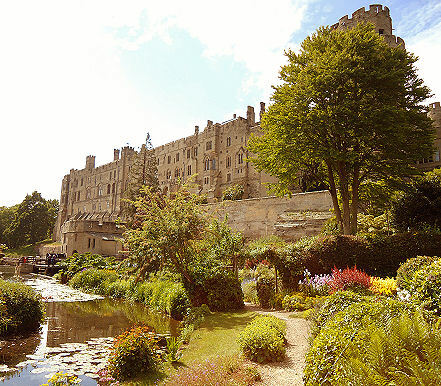 Of course if you are energetic (and rich as the entrance fee is steep as they assume you are there all day) you can go into Warwick Castle and climb the towers and battlements to get a great view down on to the Mill Garden. If you are not energetic, as there are over 500 steps on several spiral staircases to negotiate then you can look at my photograph below! Of course the State Rooms and the many exhibits such as the Kingmaker exhibition are also well worth a visit and there’s even some topiary in the gardens but that’s saved for another page.